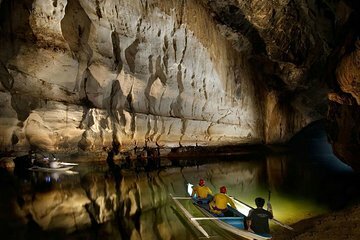 Visit the Puerto Princesa Subterranean River National Park, and paddle down the Puerto Princesa Underground River on this 8-hour tour. This underground river is one of the longest underground rivers in the world. Board a boat at the mouth of the cave at Sabang Wharf, and stop at the Buenavista viewpoint for views of the Ulugan Bay. You can also choose to upgrade to include a group or private trip to a ziplining experience at Ugong Rock Adventure Zipline and Spelunking. This was a lovely tour. Our tour guide was awesome. I enjoyed it so much! Awesome tour! Josh, our guide, was very amusing and knowledgeable. The Ugong Rock activity didn't seem as much during booking, but it certainly paid off! The constantly talking boat driver inside the cave was very annoying (noise is prohibited); no fault of the agency though. Very good organization, many thanks to Donna, everything was fine. Transport excellent.Driver excellent. tourist guide excellent. amazing place, highly recommended for anyone.